TUCSON, Ariz. - More new downtown developments -- more people living downtown -- and a mystery employer who could bring 350 new jobs to downtown Tucson. that's just some -- of what came from Tuesday's meeting of the Rio Nuevo Development District . People used to complain Tucson's downtown was somewhere between sleepy---and dead -- now it's full of entertainment, restaurants and places to stay. To attract a new company downtown, and all the money it will add to the economy, the board is putting up 650 thousand dollars to guarantee employees will have a place to park. Board Chair Fletcher McCusker says Sun Corridor recruited the company and for now the name---is a secret. "We know this is a national corporation, a recognizable brand with 350 employees that would relocate to Tucson with an average salary over 60 thousand dollars a year and they want to be in our downtown." McCusker says more people are living downtown. He predicts a total of five thousand apartments and condos. Some of the living space could be on top of the building that used to house the Wig O Rama wig store. It was restored after a disastrous fire six year ago but now developer Marcel Dabdoub is working to convert the building, with entertainment space on the ground floor, and plans to add three floors of living space. "Which can be leased either as, one year residential units, unfurnished or furnish some of the units and offer them as short term rentals or extended stay rentals, or even office spaces." The board is working to acquire a prime spot on Broadway---the old public access TV building the City of Tucson owns now. And farther east on Broadway, Rio Nuevo is working to set zoning standards for the Sunshine Mile , a strip of 1950s era buildings soon to be affected by the widening of Broadway. 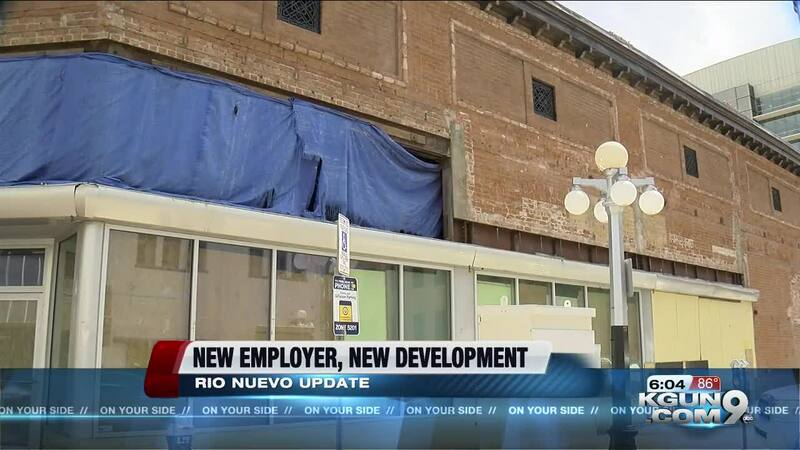 As businesses lose space in front of their buildings Rio Nuevo is working to create alternative parking and build the sort of atmosphere that's been attracting more people downtown.